For this spring issue, we've decided to talk about the weather... beyond any meteorological considerations of course, even if we Parisians have to admit that we are more than glad to see the sun again! A positive shower of records has rained down on the art market over the past few weeks. For Paris alone, numerous specialties registered bids of over a million, first and foremost Old Masters, dominated by the figures of Jacobus Vrel and Charles le Brun. The latest analyses of the Chinese market, somewhat on the gloomy side, led us to fear a drop in prices. But far from it: there is no depression for ceramics, bronzes or textiles from the Middle Kingdom. Lastly, we note that the volume of sales for drawings, the Parisian speciality of the month, has hardly changed at all, an upward price curve has been noticed for 19th century works. So these are our news for the last few days. Forecasts, meanwhile, look pretty sunny judging by the May programme, which includes a Japanese lacquer chest that once belonged to Mazarin, a painting by Nicolas de Staël and a terracotta from the Renaissance. Once again, in contrast to many other sectors, the barometer for art and the art market is set fair! The subject might seem austere. But far from it. 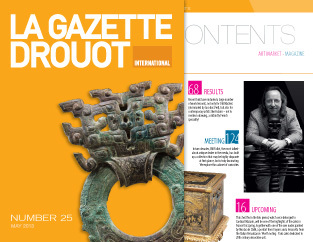 The exhibition devoted to Chinese bronzes from the Meiyintang collection by the Musée Guimet in Paris is truly fascinating for the richness and variety of its treasures. 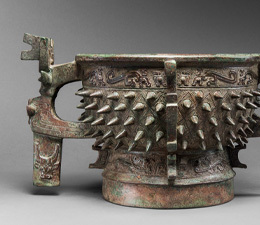 Staged like genuine jewels, these ritual objects made for Shang and Zhou sovereigns bear witness to the mastery of Chinese bronze-makers from the 16th century BC onwards, and the considerable refinement of this ancient civilisation. The exhibition's two curators, Marie-Catherine Rey and Huei-Chung Tsao, talk about its high points. Jacobus Vrel left an extremely small body of work. Since his rediscovery by Clotilde Brières-Misme in 1935, no more than forty works have been listed. Of the 17 sales mentioned by Artnet, nine works are certainly by him, and the others are attributed to him or his circle. This peaceful "Woman reading" thus shot in dazzling manner to the top of the artist's achievements on 10 April in Paris (Fraysse & Associés), when she fetched €2,232,000, after an estimate of €120,000. bundle of energy, hair streaming in the wind as he strides through the frame of the porte-cochère, he introduces himself: "Bill Pallot – sorry I'm late!" A few floors higher up, still at a run, he welcomes you to his world, briefly glimpsed in the dark: an ambiance of theatrical reds, golds, intense, dazzling lights and dark bronze patinas. Ensconced in an armchair like Ingres' Monsieur Bertin, he receives you in his cabinet of curiosities under the watchful eye of a Samurai armour. If you want a job done well, do it yourself... A motto that Stephan Lanez adopted when he created his own design production company in 2011. This young designer is no novice. He graduated from the ENSAD decorative arts school in 2004, opened his own research consultancy five years later, and started up an architect's firm with Aurélia Horneckert bearing both their names. The term "Dark Romanticism" designates an aesthetic that began developing in literature and the fine arts during the 1760s and 1770s. In contrast to the Enlightenment, it advocated a different sort of freedom from the kind promoted by the French Revolution: that of giving free rein to the occult worlds within man. The exhibition at the Musée d'Orsay entitled "The Angel of the Odd", presented last year at Frankfurt's Städel Museum, splendidly demonstrates the extraordinary exaltation produced through feeling, capturing and transcribing the depths of a soul subjected to overwhelming supernatural forces. According to specialists in the subject, the first gardens were Egyptian. Designed for high dignitaries, or even for gods, they arose from the desert at a time when man was becoming sedentary and sought to be close to cool oases. However, this should all be seen in its original context. This was a people who, in hostile lands like arid North Africa, succeeded in dominating nature in the face of all opposition. While the leafy verdure of a garden is perfectly familiar to us, just imagine for a second the effect it would have on the Egyptians of those times.